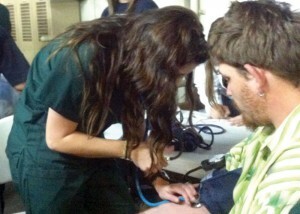 SHAWNEE—Seniors in Oklahoma Baptist University’s College of Nursing carried out service projects in recent weeks to benefit members of the Shawnee area through health and hygiene education and screenings, as well as provide disaster preparedness for the OBU community. Through the Community Nursing course, OBU nursing majors are assigned the task to develop a community project that would benefit the community in some way. One group, led by nursing major Jonathan Philips and faculty member Valarie Watts, served Nov. 16 at the Shawnee Rescue Center, a local non-profit organization dedicated to helping the homeless and underprivileged people of Pottawatomie County. Philips and Watts, along with seniors Kassidy Anglin, Elissa Garbiso, Brandy Moore, Jenni Morales and Paige Terry, helped Shawnee-area residents access basic hygiene products and educated them on the importance of keeping warm, controlling infection, hand-washing and other simple steps to stay healthy. The group distributed coats, hygiene supplies, resource booklets, blood pressure screenings, lice screenings and diabetes screenings to about 300 families at the Shawnee Rescue Center. In the end, 227 coats were donated and 300 resource booklets were provided for Shawnee families. Another senior nursing group, consisting of Autumn Simms, Barrett Cook, Olumayowa Akinyode and Tolani Olabode, contributed to the OBU community by setting up a disaster preparedness booth located in OBU’s Geiger Center. The booth contained information about what to do prior to, during and after emergency situations such as tornados, earthquakes and fires. Group members passed out brochures with tips for disaster preparedness and a map of the locations of storm shelters on the OBU campus. Visitors to the booth entered a raffle for a chance to win a “Go Bag,” which included essential items for the 72 hours following a disaster. Additionally, a computer set up at the booth gave students a chance to sign up for OBU’s text and email alert system. The system warns students, faculty and staff of incoming severe weather and storm warnings. For more information about the Shawnee Rescue Mission, visit www.shawneerescuemission.com, or call 405/878-8700.